The sparkling blue waters of Vancouver Island, which has one of the world's most sublime coastlines, is the habitat of elusive orcas. To see orcas or killer whales in their element, travel writer Martin Fletcher kayaks for six days and camps in the wilderness of Canada. Encountering a pod of orcas is exhilarating, and immediately the misty landscape with multiple shades of grey no longer feels drab but ethereal. Read the travelogue and view photographer Ken Spence's lush images in the November issue of The Life, ST's digital magazine, which can be downloaded for free from The Straits Times Star E-books mobile app for iPad and Android devices. Chic and edgy florists are popping up around town. The owners are young women who have left jobs in creative industries such as fashion and journalism, and have set up their own businesses offering blooms with a difference. 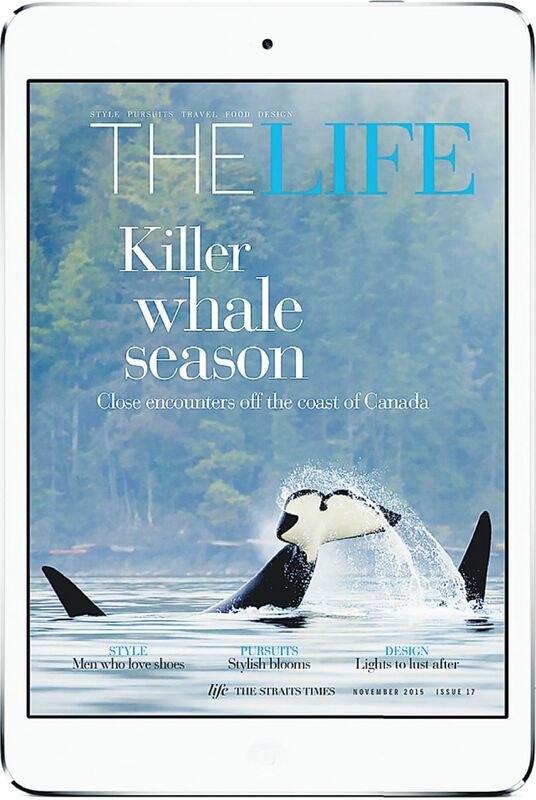 • The Life can be downloaded for free on The Straits Times Star E-Books mobile app for iPad and Android devices. • Go to the Apple App Store or Google Play to download The Straits Times Star E-Books app. It is free. • The Life is best viewed on an iPad or Android tablet and is best downloaded where there is Wi-Fi. Unlike traditional florists who use common flowers such as red roses, these florists use exotic ones such as the fragrant David Austin roses, Alstroemeria, also known as a Peruvian lily, and succulents. Spago is the latest celebrity restaurant to open at Marina Bay Sands, next to its infinity swimming pool. It is worth going to not just for its panoramic views, but also because it boasts very good food created by well-known Los Angeles chef Wolfgang Puck. The cooking fuses elements of East and West, with some new dishes inspired by Singapore favourites such as kaya toast and laksa. Leave room for the amazingly light salted caramel souffle.